DECT IP alapkészülék Gigaset kiegészítők számára, akár 4 párhuzamos hívás egyidejű kezeléséhez, kivételes hangminőséggel és kompatibilitással; számos VoIP és PBX szolgáltató készülékeivel kombinálható. The N510 IP PRO DECT IP base station gives you a top-performing mobility solution for up to 6 users. Up to 6 handsets can be registered on the DECT IP base station. You can select from a wide range of compatible Gigaset handsets. The DECT IP base station supports up to 6 different VoIP accounts and phone numbers – great for multiple users or several lines. Up to 4 calls can be performed in parallel. The online directory is excellent for looking up people and businesses in the net directories of numerous online phonebook providers. Together with Gigaset T300/T500 PBX the user can also browse the corporate phonebook by handset. The email viewer sends an automatic notification of each new email that arrives in the user’s account, including the sender, time/date, subject and text. The DECT IP base station offers the convenience of ‘0’-touch installation together with the Gigaset T300/T500 PBX. With other PBXs and providers, MAC-based autoprovisioning or configuration code setup makes installation easy. 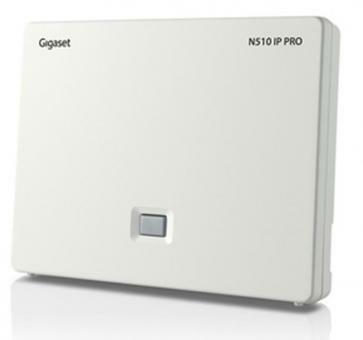 The energy-saving power supply of the Gigaset N510 IP PRO consumes less electricity2, so it’s kinder to the environment, and kinder to the user’s wallet. Like all Gigaset base stations, it variably reduces the transmitting power from the handset to base station depending on their distance apart. Users can also reduce the transmitting power of the Gigaset N510 IP PRO by 80%5 simply by selecting ECO Mode on registered handsets. In addition, selecting radiation-free4 ECO Mode Plus on registered handsets turns off the transmitting power when the base station is in standby.